What a way to start the first report of the year! Nothing used, Nothing added! Woot woot! As part of my 2016 goals, I want to start tracking my hobby spending. I’ve set the budget for the year at $3,000 and I’ve allocated a bit for sewing machine servicing, spending money at Road, spending money at QuiltCon and a monthly allowance for bits and things. I’m not looking to add fabric this year as I want to shop my stash first. But I know that I’ll need some backing as I finish tops up. I already have backing for the next 3 quilts so I’ll not need that for awhile unless I start quilting up a storm. I know there are some things I want to get – inktense pens, for example, and creative grid rulers. But I don’t NEED anything. I also know myself and once I get to those shows, I’d want to buy. So, best to set my budget now and be realistic. 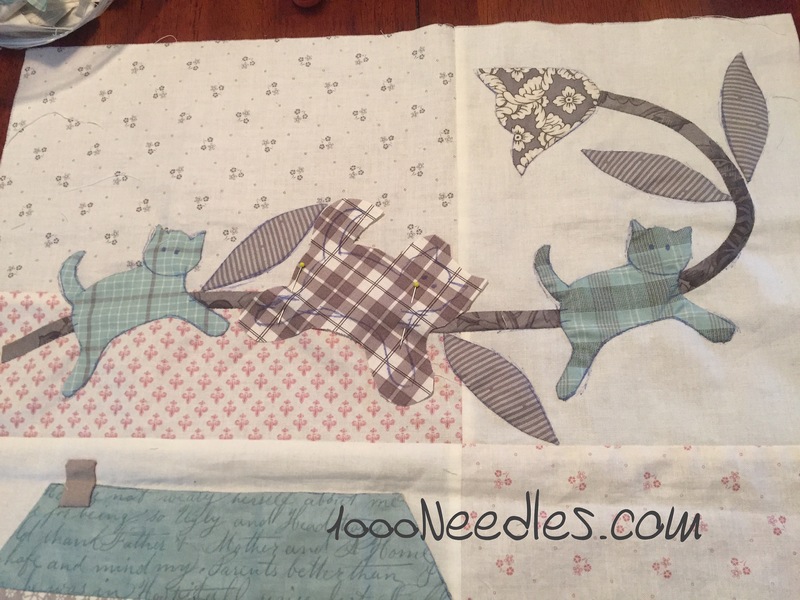 And for Slow Stitching Sunday with Kathy at Kathy Quilts, I’m going to continue working on Raining Cats and Dogs. I worked a bit on the cat yesterday but failed to take a picture. I hope to have enough energy and time to finish the cat. Here’s a pic before I started working on the final cat. 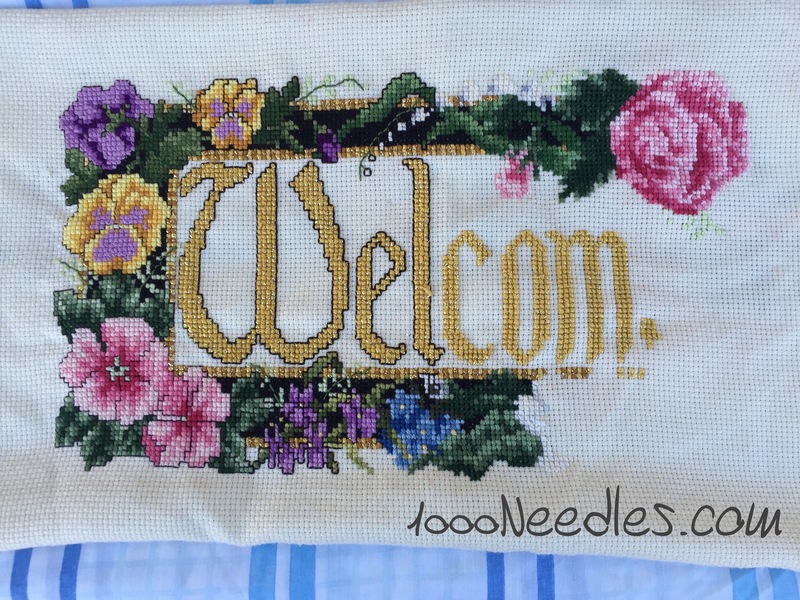 I’ll also get some more stitching done on my Cross Stitch “welcome” project. And afterwards, I will get more of the quilting done on Tell It To The Stars. I’m working on the orange parts today and I hope to get all those orange parts done. HI, I love the raining cats and dogs. Is it your own design? I do have a question, what is inktense pens? I don’t know that I have heard of them and since I *love* gadgets, don’t want to miss out on something fun! Raining Cats and Dogs is from Ann Sutton of Bunny Hill Designs pattern. Inktense pens I guess are really pencils but I’ve seen them used on fabric and from what I understand once you’ve wet them, it sets them. They’re very similar to water color pencils but can be used on fabric. I might have the details wrong but I want to get them to try them out. Enjoy your slow stitching today… every little bit helps! Wow! That’s a lot going on at one time. Look forward to seeing your finishes. I love the soft grey of your vines and kitties against the light background. Very restful. I have no idea how many yards of fabric or yarn I have. Maybe someday I will total it up. I think that is a very generous crafting budget. Right now I am trying to mostly use what I have. I know I will need to purchase some cross-stitch fabric, but I’m not sure I will need much more than that. Your cross-stitch is very pretty and I’m enjoying watching the progress on Cats and Dogs. Thanks CathieJ! I have no idea how much fabric I have either. I’m afraid to count all of it. I’ve just been counting how much comes in and out. I’m not buying as much as I used to but that’s all because I report it each week on the stash report.